If you plan to commute year round by bike, then here are five super useful mods you should definitely consider for your bike. Sure, they’re not the most aesthetically pleasing of items and certainly not suited to all types of bike. However they are invaluable for lugging a change of clothes and packed lunch to work and the best way to transport heavy security chains that are now sadly essential in the city. Givi are the market leader for top boxes, but there are cheaper alternatives from the likes of Kappa and others. 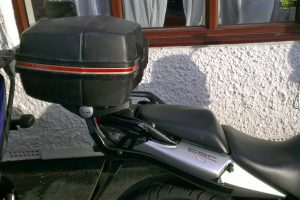 Although Givi racks are bike specific, the plates and boxes aren’t and can readily be picked up second hand. Do opt for the better rated Monokey kit, rather than lightweight Monolock ones. When you ride year round regardless of weather, wet or dry, you will find loads of crud is thrown up off road, covering your bike (and yourself). In the colder months this can include salt and grit too. All of which wrecks havoc on your rear shock, radiator, engine, downpipes etc. Left unchecked and stuff starts seizing up, causing problems and serious headaches later on. Nothing worse than snapping or shearing bolts when performing what should be simple maintenance tasks. A rear hugger can be a little tricky to fit, but are great at keeping you rear shock and linkage clear of crap. 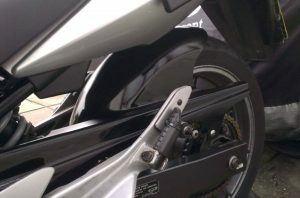 A front fender extender is very cheap and can be glued or screwed on easily to help protect your radiator and engine and reduce crud getting flung up onto yourself. Most bikes come fitted with a pretty poor horn which simply won’t get you noticed. Swapping on a louder one or mini air horn can make a surprising difference. 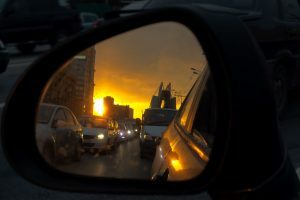 Of course not everyone uses a horn when they could, but they can be invaluable to grab someone’s attention when you see them creeping out of a blind junction, about to swap lanes or just to warn pedestrians glued to phones and jaywalking. I personally have the Stebel Nautilus air horn which has saved my bacon many times, but there are many alternatives about. 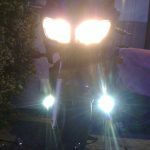 When commuting you invariably find yourself filtering through thick traffic, at dusk or on darker nights your bike will just blend into a sea of lights in people wing mirrors. Additional spot lights of DLR lights can help create a more distinctive shape that is easier for other drivers to spot and hopefully not cut you up. If you’re going to ride year round, then you need to be prepared for cold hands. Wind chill cannot be underestimated, when the temperature is close to freezing fingers soon go numb with all but the very best of gloves. 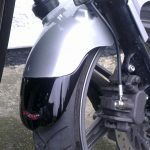 Although heated grips are not the only method to keep hands warm, they are very cost effective (~£50) and particularly useful as they will always be handy on your bike. Perfect should you get caught out with the wrong gloves or a late night ride home. Oxford and R&G are some of the main brands on the market, with many options to suit different bikes. 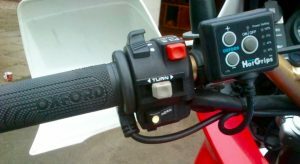 Find Oxford Heated Grips at SportsBikeShop. 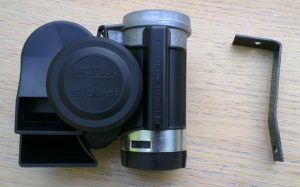 So there you have it, five useful and practical mods for your bike that will certainly make commuting easier. Have you made other mods to help your day-to-day commuting? Comment below and share what you find works well.